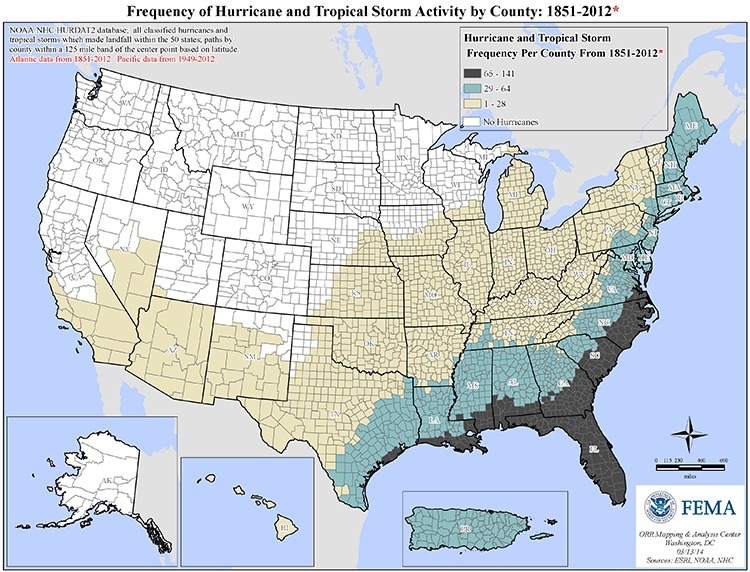 The United States has been subject to a broad spectrum of natural disasters during the course of recorded history. The size of the country allows so many various natural calamities the ability to occur, and depending on the state or region in which you live, you may be prone to more than one type of natural disaster. It’s important to know what potential risks you face and to be prepared accordingly. A disaster management plan will ensure you and your family face the best odds in the event of a flood, hurricane, earthquake or tornado. To assist you with your preparations for disaster management, we’ve outlined the most likely occurrences of certain natural disasters by region. Although earthquake activity has been recorded in various portions of the United States, 10 of the states with the most overall occurrences are Alaska, California, Hawaii, Nevada, Washington, Idaho, Wyoming, Montana, Utah and Oregon. 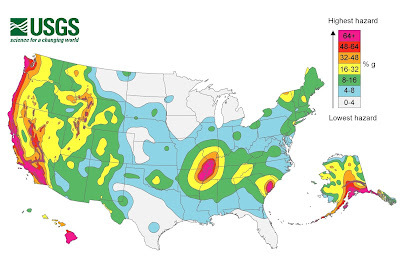 It is important to note that because these statistics are based on the number of earthquakes alone, your state’s region may be overall more prone to floods, tornadoes or hurricanes than to earthquakes. 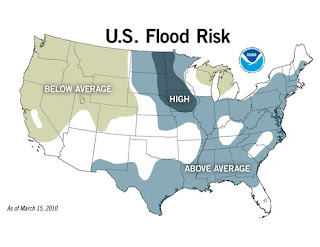 Check out USA.com for additional information about the likelihood of certain natural disasters over others in your area. If you reside in an earthquake-prone region, we recommend you plan accordingly by first ensuring you are safe inside the home. Bolt bookcases to the wall, seal cabinets properly and reinforce heavy lamps. Once your home is free of potential falling hazards, decide on the best place to hide during an earthquake. Because of the hazard of falling objects, you will be safest under a sturdy desk or table and away from windows. Although you may have heard of the “Triangle of Life” approach to earthquakes, which suggest that you should place your body near and not under an object in order to create a safe space for yourself in the event of a ceiling collapse, the Earthquake Country Alliance strongly advises against this because buildings rarely collapse in a “pancake” fashion in developed countries. If you experience an earthquake that lasts longer than 20 seconds and you are located near the shore, do not wait for an official tsunami warning; prepare to evacuate to higher ground immediately. A flood can happen any time during prolonged or severe rains, in places with poor water drainage, during heavy snow melt, and because of sudden rises in sea level due to strong winds or tsunami. Read the guidelines below to prepare yourself in case of a flood. Because standard homeowner’s insurance generally does not cover flooding, you may want to consider additional insurance to help cover water damage related to hurricanes, tropical storms and heavy rains. If you are located in the southern portion of a state alongside the Gulf of Mexico or the East Coast, chances are you’ve encountered a hurricane threat. Hurricanes are classified in five categories by wind speed and can form rapidly over ocean water when warm air rises. As a hurricane begins to near, low winds can create rip currents even at large distances, creating unseen hazards for swimmers and surfers. During its approach, a hurricane will cause water levels to rise, and large ocean swells may result in water damage miles inland. Hurricanes often produce massive amounts of rain and flooding, and flash floods can occur quickly due to intense rainfall. If inland winds reach 74 mph or more, buildings are in imminent danger of being destroyed, and evacuation should have been completed. Because of a hurricane’s high potential to inflict damages to powerlines, consider investing in a heavy-duty solar generator which will allow you to store backup power for emergency lighting, laptops and mobile devices. The Federal Emergency Management Agency suggests that, for those living in high-risk areas, a safe room will provide near-absolute protection from hurricanes as well as tornadoes. Because traditional insurance will likely not pay for any damage incurred through subsequent rains not directly associated with a hurricane, we recommend you cover any damaged portions of a roof with a tarp as soon as it is safe to do so. Many regions across the southern, Midwestern and eastern portion of the United States are capable of experiencing tornadoes. An average of 800 tornadoes are reported each year, with the region lying between the Rocky and Appalachian Mountains, also known as Tornado Alley, reporting the highest number. However, because tornadoes can occur nearly anywhere, it’s important to know the warning signs and what you can do to prepare. As in any other disaster situation, it is not recommended that you try to remove large debris, and that you remain on the lookout for loose, weakened or fallen structures, powerlines and sharp objects. How will my family and I receive emergency warnings? Where will we go in case of an emergency? How will my family locate me if we are separated? How will I let others know I am safe? What supplies will I need in the event of a natural disaster? Don’t let a natural disaster catch you and your family off guard. Be prepared in every instance. I spend a lot of time camping and outdoorsy activities. one thing I can’t live without is a camping water filer . The last thing you want when you are camping is to run of clean water. They are pretty cheap and last a really long time so they make for a heck of an investment.